Before I left for Ottawa last week, I promised a toy for Ava when I got back. I stayed true to my word, but I have some words of advice for you parents who have a young girl and plan on going out of town: Never say that you'll bring back a Barbie but come back with anything less, as your little one will be highly disappointed. I found a cute little doll that was part of a series of Canadian girls, each one with a cute outfit typical of Canadian dress (the one I found for Ava had a Mounted Police outfit). Once I showed it to Ava, she could not hide her feelings and said, "Is there more?" Not to worry, though, because Ava warmed up to the doll the following day. 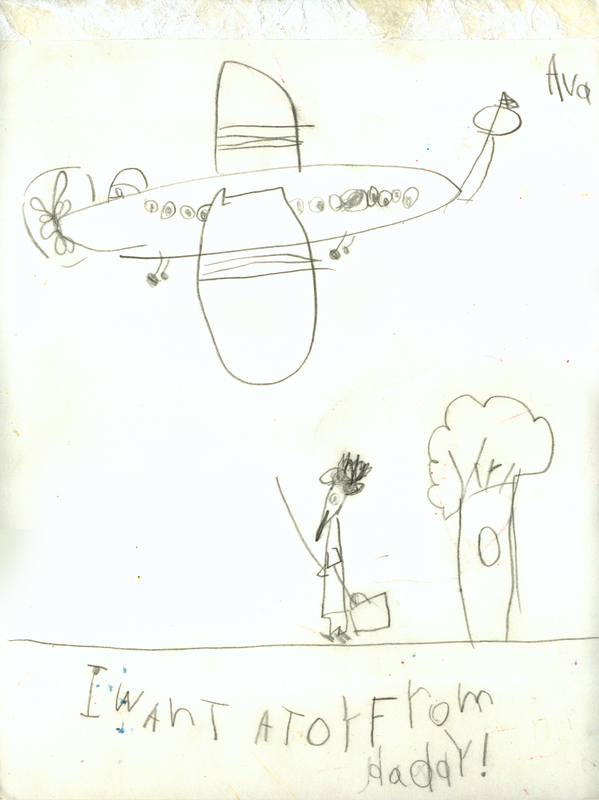 I love the way Ava drew the airplane in this drawing, but it looks to me that I missed my flight. Maybe I still have her toy in my bag there. And Andrea helped her with some of the letters at the bottom of the page. I love the way kids draw letters, don't you? And as part of my promise for an extra bonus Ava Thursday, here is another drawing -- part of that set of drawings Ava did back in June of this year (see here and here). Some more big, bold colors, big smiles, and "cool clothes" -- showing off belly buttons, of course. Love the purse, too. The little drawing of a girl in the lower left-hand corner was added on recently. Ava's rendering of your goatee is INCREDIBLE. And is that your arm extended in sadness at being left behind or is it an arrow stuck in your belly as punishment for dissing Barbie? Yeah, Ava's got my goatee down pretty good now. And since she drew this before I got home, I'm hoping that that is my arm extended out to the missed plane, instead of a fateful arrow. I deserve it, though. I'm a bad dad. What was I thinking??? oh, I felt so bad when she said that to you. but you have to know that she does that to me all the time-- I'll bring something really great home from the thrift store and that's exactly what she says to me: "is there more?"... she's just at that age. and you know I didn't let her get away with saying that, right? you better believe we had a little 'talk' about being thankful and gracious after you left. in regards to the drawing, I can't believe how well she drew you! so funny. i think your holding a sword... and you're gonna attack the plane like Zorro. that roque is a funny guy. yes the goatee is rather incredible isn't it. what amazes me here is her airplane. the eyes have so much character, the propeller is moving and the wings even have some perspective. For the most part, our daughter is pretty easy to please giftwise and enjoys just about anything given to her, but last Christmas we had to have a little "discussion". Toys, books, and the such were greeted with glee, but the random gift of clothing yielded a somewhat commanding, "NEXT! ".